Water conservation and restrictions do not necessarily mean that your Xeriscape garden consist entirely of cacti and rocks. There are a number of beautiful shrubs that are decorative and drought tolerant. If your taste runs to dwarf shurbs, there are several varieties of holly such as the dwarf burford holly, the dwarf pittosporum, the dwarf yaupon holly, and others. There are also variagrated varies of holly such as the gulf stream or nana with reddish evergreen foliage. Holly shrubs do well in sun or shade. The red yucca, another favorite, sports red flowers on tall spikes. The red yucca requires sun. Flowering quince, a sun-loving shrub, will give a splash of spring color with red, pink, orange, or white blooms. Glossy abelia provides year-round enjoyment with bronze evergreen foliage and is suitable for either sun or shade. Another sun or shade plant is the Indian hawthorne. It is evergreen and produces flowers in spring and blue berries in the fall. If your bent runs to the dramatic, try the Central Texas sage with its dusty gray evergreen foliage and summer-long blooms of vibrant pinks and purples. Some shrubs grow to be as much as 10 to 25 feet tall and can be mistaken for trees! 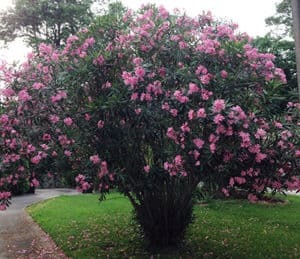 The oleander has spiky green foliage and stunning flowers; the Texas mountain laurel boasts colorful lavender or purple flowers. You’ve worked hard to get our outdoor landscape just the way you want it. Then you begin to notice yellow spots developing on blades of grass all over your lawn. What happened? And what can you do about it? Assuming that you’re watering your lawn properly and not over-fertilizing, disease and pests are the most likely culprits. The most common diseases are iron chlorosis, which indicates nitrogen deficiency in the soil and yellow patch, which causes large spots or patches with yellow margins in the lawn. As for pests, chinch bugs cause irregular brown spots that turn yellow. Each of these three problems has its own particular set of symptoms. Iron chlorosis manifests as yellow or striped yellow and green patches of grass blades on alkaline soils with high phosphorus levels. Yellow patch manifests as 6 to 12-inch wide patches on grass blades that occur in areas that are prone to either excessive shade or moisture. Chinch bugs cause yellowing by sucking essential juices from grass blades. Using a foliar application of iron sulfate, spread a one-quarter inch-thick compost over the turf and aerate the lawn twice a year. The damage caused by this disease is usually no more than cosmetic. But if the outbreak is severe, you may need to use a registered fungicide. Aerate the soil one to two times a year to treat chich bugs and apply a registered insecticide to deter them. If the problem is with how you are watering your lawn, grass blades will look different than if they are diseased or overrun with pests. Overwatering causes grass blade tips turn yellow and the blades themselves wilt. 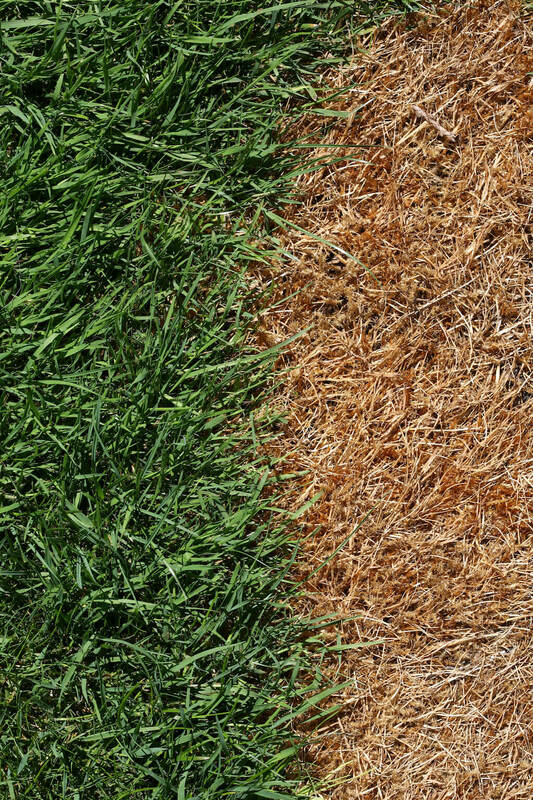 Underwatering causes grass blades to fade to yellow before turning brown and drying. If you are improperly fertilizing your lawn, then you will see a scorching effect that strips it of its healthy green color. To address these particular issues, remember to use the recommended amount of fertilizer at the specified time/season. And if you haven’t been careful about watering, be sure to provide your lawn with — depending on the heat — anywhere from a half inch to one-and-a-half inches of water every week during the summer. At South Austin Irrigation, we’re committed to helping you achieve and maintain more beautiful lawns and gardens. We offer irrigation system sales and repair service as well as expert horticultural advice. For all your landscaping needs, contact us today! Say What? Lake Travis Now More Than Full! Austin is officially out of the great Texas drought that began in 2010, incredible as that may seem. That’s welcome news to residents who have been rationing water for the last several years. 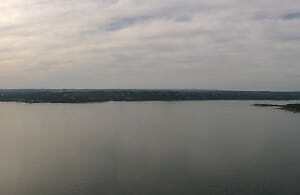 According to golaketravis.com, Lake Travis, which is considered full at 681 feet, is now slightly above that mark at 681.2 feet. Who would have thought last year at this time that this was going to happen? 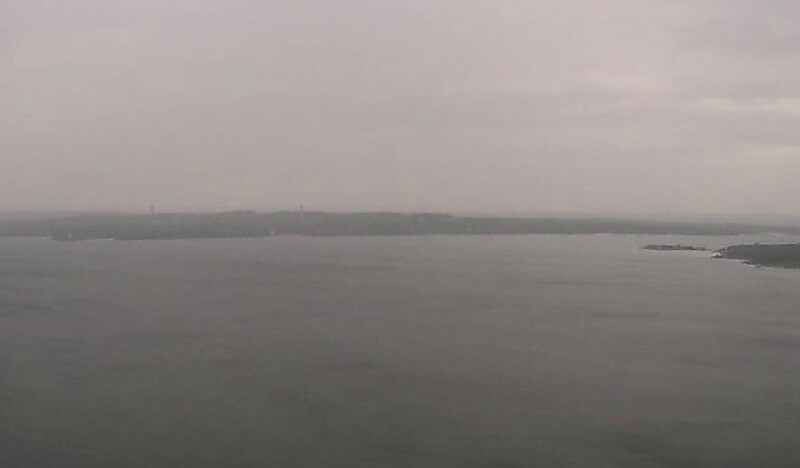 Moreover, Lake Buchanan is now 89% full. So when both lakes are considered together, they are 96% full. Great news for everyone! However, Austin is keeping Stage 2 water restrictions so please keep this in mind. Just to let you know, a full Lake Travis can store an additional 787,000 acre-feet of water in its flood pool without a problem of flooding. And if the water level does go up higher, there would be releases of water at three control points — Austin, Bastrop and Columbus — on the Colorado River downstream of the Mansfield Dam. Water would only flow over the Mansfield Dam spillway in the event Lake Travis rose above 714 feet. And according to the LCRA website, the highest level Lake Travis ever reached was 710.44 feet on December 25, 1991. Summer is coming so don’t forget to get your irrigation system checked. For the best in irrigation system service, call South Austin Irrigation at (512) 534-7449. When it comes to water, Austinites have a great deal to be thankful for this holiday season. According to golaketravis.com, the Thanksgiving weekend rainstorms were concentrated in the Hill Country. Some areas in that region received more than 2.5 inches of rain in three days: and the Hill Country is the primary recharge zone for the Highland Lake chain, which is where Austin draws its water. Currently, Lakes Travis and Buchanan are seeing their highest levels since December 2007. Looking back to January of this year, Lake Travis was sitting at 624 ft. Since then, it has risen a little over 50 ft. for the month of December, at 674 ft. Lake Buchanan has seen a similarly spectacular rise. It began 2015 at 986 ft. and is ending the year at 1011 ft. (it’s considered full at 1020 ft.). Lake Buchanan is the highest in the Highland Lake chain and Travis is second lowest. 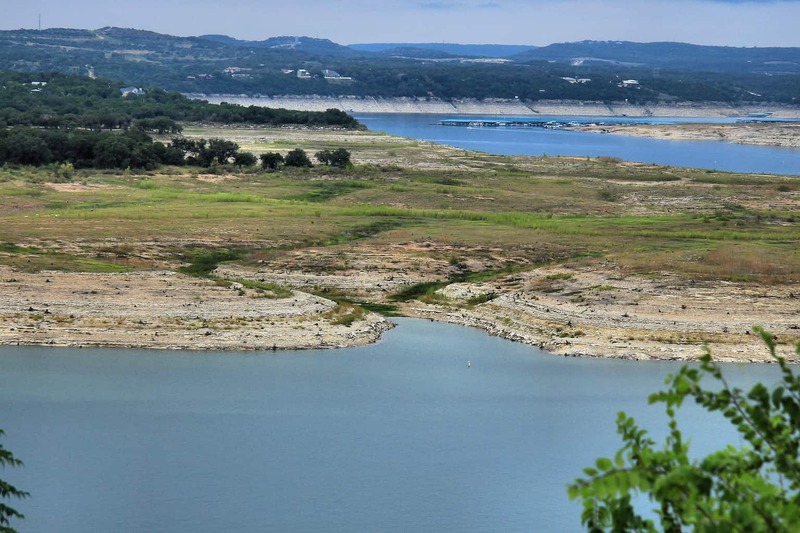 Runoff from Lake Buchanan works through Inks, LBJ and Marble Falls and eventually ends up in Lake Travis. But Buchanan is located deep in the Hill Country, which on average sees less rainfall that areas closer to Austin. The situation in the rest of Texas is now great. The state is now drought-free with only a few regions in the south and southwest registering abnormally low levels of moisture. Central Texas became drought-free in early November and is free of even long-term low-moisture spots at this time. All this excellent news, however, does not mean that Austinites are now free to waste water. According to the latest data from Austin Water Utility, the city is still in Stage 2 Water Restriction . So despite the good news, Austin is playing it smart – and safe – and conserving the one resource that is so vital to preserving the health and beauty of our unique landscape. At South Austin Irrigation, our experts are here to help you with all your irrigation repair needs. Keep us in mind when your irrigation system needs service or repair.